The problem is real. The time is now. There is no reason to put it off. We put families back together. As many readers will remember, The Alcoholism Revolution was published as a special feature in the August 1992 issue of Professional Counselor. This paper defined the polarity in the field of addictions: the conflict between two irreconcilable points of view, the psychogenic and the biogenic. Virtually all of the responses to that article have ranged from moderately to enthusiastically positive. Briefly, the psychogenic model is based on the nearly universal belief that alcoholism is a symptom or consequence of an underlying character defect, a self-destructive response to psychological and social problems, a learned behavior. The biogenic model recognizes that alcoholism is a primary addictive response to alcohol in a biologically susceptible drinker, regardless of character and personality, or of cultural or psychosocial influences. Overshadowed by the multitude of researchers who were busy confirming that the psychogenic paradigm is devoid of any legitimate data base, many others were quietly compiling a massive amount of empirical evidence that alcoholism is a primary, biogenic disorder. As all longitudinal studies have verified, all of the psychopathology of alcoholism, as alcoholism, is of neuropsychological origin. However, this fact is disguised because alcoholism is never diagnosed until after character and personality are distorted and normal emotions are neurologically augmented to abnormal levels of chronic anguish, fear, resentment, guilt, and depression. It is these distortions that clinically identify alcoholism, not the original character and personality. The earlier effects of trauma or abuse, or of being raised in a dysfunctional alcoholic family, are complications—but not contributing causes—of alcoholism. Most often alcoholism is hereditary, but many individuals become chronic alcoholics through cross-addiction to other drugs (prescription or illicit) or as the result of other brain or liver insults. Endless attempts at compromise have failed because the two views are not complementary, but mutually exclusive alternatives, like a perceptual figure-ground reversal. Compromise was the fatal flaw in the Jellinek “disease concept” of alcoholism. 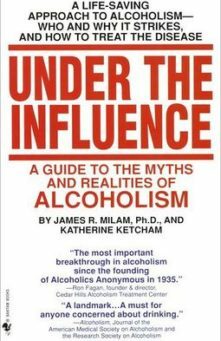 For all his helpful descriptions of the progression of the disease, he endorsed the false belief that alcohol is primarily a sedative drug and that alcoholism is caused by excessive “relief drinking,” drinking to relieve psychosocial stress. Thus, as secondary consequence or symptom, the biology of alcoholism could be largely ignored by the establishment in its diligent search for the presumed primary psychiatric cause of relief drinking. Following Jellinek, many leading proponents of the disease concept still try to have it both ways, to assimilate the fragments of the biological knowledge within the lingering psychogenic hegemony. Some still mindlessly refer to addiction as “substance abuse.” This conformity necessarily condones the misinformation that continues to tear the country to pieces and helps to delay the emergence of the biogenic paradigm. The Alcoholism Revolution does make extraordinary demands on the reader. It presents an original conceptualization without a preexisting frame of reference. Ordinarily, scientific truth can exist only after it is confirmed through procedures of qualified peer review and consensual validations. That paper explained at length why the biogenic paradigm has had to make its debut without the usual scientific pedigree or academic blessing. The normal avenues of critique and authentication have not been available. Historically, these internal channels have been open to important outside contributions, even revolutionary ideas, provided only that they met high screening standards of scientific integrity and academic scholarship. In recent decades these standards have been progressively compromised in obeisance to the higher priorities of publish-or-perish, grantsmanship, and, more noticeable recently, political correctness. Shielded within this more general degradation, the circumscribed field of chemical dependency witnessed the avenues of impartial review gradually narrow as a result of discriminatory screening until finally, during the early 1970s, the whole mechanism of consensual validations was hijacked by a tiny band of extremists, and it remains their captive. Prof. Irving Maltzman’s confirmatory paper, “The Winter of Scholarly Science Journals,” published in Professional Counselor in October 1992, documents the capture of the academic peer review procedure and its continued subversion to protect the otherwise discredited psychogenic premise. It is this distortion of reality that sustains both alcoholic denial and the delusion of recreational drug use, thus perpetuating the drug epidemic. Although it was clearly by necessity and not by choice, the fact remains that the biogenic paradigm was conceived and nurtured in alienation from the scientific establishment and that it has been presented to the public as a mandate for insurgent reform without first passing through the naturalizing process of peer review. Therefore, although it has waited in vain for an impartial assessment for more than 20 years, it may be that the paradigm and its supportive evidence must continue to wait in limbo pending scientific ethical reform. But for both principled and urgently practical reasons this is not necessarily the case. Given the widening distribution of enlightening information about the scientific paradigm shift, the court of public opinion may at any time simply preempt the corrupted lower institutional court of peer review and initiate this cultural reform. To further enable and encourage this to be done, the following examples and clarifications address what appear to be the remaining reservations and skepticisms about the paradigm shift itself. As a first illustration, it was widely reported that upon returning home, drug-using Vietnam veterans demonstrated that illicit drugs are non-addictive by simply stopping their use on their own, without addiction treatment or withdrawal reactions. Aside from the widely accepted anecdotal reports, support for the argument has come from studies involving unreported cross-addiction. To those who deny the very existence of physical addiction, the idea of cross-addiction is also meaningless, and thus neither reportable nor subject to surveillance. As a local option, along with psychotherapy, many VA psychiatrists routinely and unremarkably switched traumatized, addicted returning veterans to cross-addicting prescription drugs—tranquilizers, sedatives, and antidepressants, with methadone for heroin addicts. With this unlimited largess, financial support, a disability pension in the offing, and therefore ample money for alcohol, these now lawfully addicted veterans could stop the use of illicit drugs “on their own, without addiction treatment or withdrawal reactions.” However, over the longer period of a decade or so, the subsidized poly-addiction produced a familiar result. A normal brain processes trauma and grief, gradually disposing of them as fading memories. A toxic brain cannot accomplish this work. On the contrary, as addictive disease progresses, old hurts fester and become ever more inflamed and unmanageable. In Vietnam veterans this iatropic (therapist induced) exacerbation was not recognized or reported as such; instead it was simply given a new name: Post-traumatic Stress Syndrome. The new diagnosis played well to a guilty society whose negative attitudes toward Vietnam veterans did in fact complicate and slow their postwar healing. By thus ascribing the later inflammation to the earlier trauma and negative social attitudes, and by not mentioning the prescription drugs or alcohol, by default both illicit and prescription drugs were exonerated as non-addictive. No one seemed to notice that while drug-prescribed veterans were deteriorating into their post-traumatic stress syndrome, equally traumatized and equally addicted veterans who were effectively treated for their addiction, and taken off all drugs and alcohol, recovered and got on with their lives. A second type of spurious evidence exploits the variabilities in the onset of addiction. The strength of addiction is progressive, often starting near zero and growing stronger at varying rates in different individuals. Usually there is a threshold below which each user can and will stop on his own, given a sufficient deterrent. Again, sans physical addiction there is no threshold to report. It has been easy for these researchers to contrive samples of sub-threshold drug users who simply quit on their own. And of course, drug “abusers” who temporarily or permanently switch to alcohol can also be said to have quit drugs on their own. First: the significant amount of error that inevitably flows from inadequacies in the prevalent psychogenic DSM-IIIR and other commonly used diagnostic criteria. Second: the errors stemming from imperfect diagnostic training, experience, and skill, and limitations in research design and implementation, as well as in subject availability and selection. Third: errors systematically produced by the fact that totally abstaining alcoholic parents and offspring are commonly classified as non-alcoholics, resulting in false negatives in the experimental offspring controls. Fourth: through cross-addiction to prescription or other drugs, many of the offspring of genetically non-alcoholic parents become alcoholics (more false positives), while unknown numbers of genetic alcoholic offspring switch from alcohol to addictive drugs (more false negatives). Finally: the errors produced by such other biological factors as liver and brain diseases or injuries that affect both alcoholism susceptibility and manifestation, and, of course, the usual uncertainties about paternity. In the fourth illustration, still wedded to the psychogenic paradigm, NIAAA was constrained to devote much of the last winter issue of its quarterly Alcohol and Research World magazine to still more studies of occupational differences in alcoholism rates. The relatively small differences were attributed to stress factors and job cultures. The typical reader would see nothing unusual in this addiction to the flow of trivia into the alcoholism literature because here the sin is one of omission. Not mentioned were the differing racial representations among groups, which earlier studies, long since purged from consideration, have shown are the significant sources of variance in alcoholism rates among occupational groups. Thus, disguised genetic effects are spuriously assigned to job culture causes, with an appeal for more alcoholism money to further analyze the latter. Similar strategies of obscuring and misrepresenting genetic contributions to alcoholism rates are employed in other epidemiological and demographic studies. The common practice of lumping into categories, such as “white” or “Asian,” cancels most of the extreme genetic variance. Knowing that, when controlled for heredity, cultural attitudes and practices are not contributing causes but consequences of profoundly differing historical experiences with alcoholism, some of the earlier legitimate occupational studies are as amusing as they are instructive. American clergymen of all faiths, with their mix of Irish, Blacks, Scandinavians and other highly susceptible groups, have an alcoholism rate not 40 percent higher, nor four times as high (the typical range of differences in the NIAAA occupational comparisons), but over 40 times as high as members of the Italian Mafia. So much for stressful work factors. That Native Americans have an extraordinarily high susceptibility to alcoholism, conservatively above 80 percent of those who drink, in itself is an unfortunate fact, like the fact that some groups can’t digest milk from cows (except that milk has high nutritional value and the ability to digest it might with more justification be construed to have survival value). Their high alcoholism susceptibility was immediately evident while they still owned the country as a proud, brave, highly developed people and the white man was still a tiny minority along the eastern seaboard. Thus their severe alcoholism problem is not caused by a native inability to cope with discrimination, or poverty, unemployment, or battered self-respect, as virtually every news story deploringly implies. It is their genetic alcoholism that has exacerbated all of these problems and destroyed their ability to surmount them. Again, it is iatrogenic circularity that has disenfranchised them, laid the insanity of alcoholism on their character and culture, added egregious insult to already fatal disease, and converted this limitation—otherwise manageable through abstinence—into a genocidal disaster. Incredibly, mental health specialists would now have us believe that this profound inversion of reality should be the prototype for the treatment of the many other “victim” groups. Thus we are advised that addiction treatment should focus on the special “underlying” problems of being a woman, an African-American, a Chicano, a homosexual, a victim of sexual abuse, or whatever. Nothing could be more destructive. On the contrary, first restore them to sanity and selfhood through thorough addiction treatment, emphasizing the commonalities with other addicts. Only then can they be helped to realistically address and cope with their special social and personal problems. First, no such causes have been verified for inclusion. Second, the new paradigm accounts for alcoholism without requiring such causes. Third, as illustrated above, it explains why so many such factors so compellingly seem to be causes when in fact they are not. Fourth, it explains why the unwarranted inclusion of psychosocial factors as causes only creates an iatrogenic psychiatric problem that blocks recovery. Really extreme would be to continue to include such factors. Therefore there is everything to gain and nothing to lose by taking the inevitable step of abandoning the one paradigm for the other. Only then will it be realized that any as yet unverifiable contributing psychosocial causes would have a far better chance to be delineated and confirmed within the new paradigm. Of course, because such factors are not needed to fill any gaps, the assessment of their importance could not possibly precede but only follow their discovery. There is reason to hope that as copies of The Alcoholism Revolution continue to circulate they will create a kind of critical mass of enlightenment that will, through the communications media, explode into public view. To this end, please continue to distribute copies, especially to government officials and community leaders who may influence the shape of healthcare or judicial reform. And be sure to make copies available to “multipliers,” those who will distribute even more copies. Please feel free to also print, photocopy and distribute this paper at your discretion. Just remember that it is a sequel to The Alcoholism Revolution, not a stand-alone substitute. I really find your paper exciting. I would simply add a comment that the disadvantage of the biogenic paradigm not being widely recognized is really not a fault of the paradigm itself but of those of us who are still in the dark ages. I am delighted that the paper has been written and hope that it gets wide publicity. I truly believe that your recent article, The Alcoholism Revolution, is one of the best papers I have ever read in my life, and it certainly states our belief here very clearly. It is a persuasive paper…enlightening, if not particularly edifying. I will try to share your paper with some of my legislative leader friends. I will shortly assume the Chair of the Kaiser Family Foundation. I intend to bring your paper to the attention of the foundation staff, and perhaps we will have some opportunity to examine this field of addiction. It’s superb. I have given out some 50 copies, and it’s receiving a warm reception in Maryland and Washington, D.C. I have distributed your paper to professionals in the Danbury treatment field as I believe it to be of immense importance. The Drug Policy Foundation could sure use your point of view, and I have taken the liberty of sending your paper to them. I am grateful to you for your book, Under the Influence, and your current article. I shall use every opportunity to promote your Biogenic Paradigm in my small segment of the treatment profession. Your most recent article has been well distributed by me to providers and legislators… We are establishing the annual James Milam Award for Addiction… You are deeply appreciated, and it is difficult to find persons to give this award who approximate even a portion of the contribution you have made. It was with great pleasure I read your paper… In a just-senate-approved, compulsory, 30-hour addiction program…for medical students, we teach the “Biogenic Paradigm…” I have just been elected to the Board of Directors of the American Society of Addiction Medicine to represent Canada… would love to get you involved here. I must say that I was completely unprepared for the impact your paper had on me. I was so impressed that I read it out loud to my wife (I hadn’t done that in 20 years!). I just had to write to tell you, the piece is superb. Please enter your e-mail and we will e-mail you a copy of the E-Book of your choice. FREE Drug & Alcohol evaluations.